Lake Tahoe Weddings - Stress Free Affordable and FUN! Our all inclusive Lake Tahoe Wedding packages have EVERYTHING INCLUDED you need to plan your special day! We can help make your dream wedding come true by booking the perfect Tahoe wedding venue. Fill out our easy order form to start designing your perfect wedding- It's that easy! Book your dream Lake Tahoe wedding today! A Tahoe wedding should be everything you dreamed! With Lake Tahoe boasting numerous world-class wedding venues, mountain luxury hotels, premier wedding vendors, as well as, an abundance of exquisite restaurants and bars, planning a wedding at Lake Tahoe is almost effortless! Lake of the Sky Weddings is the premier Tahoe wedding resource for featuring hand-picked trusted professionals, wedding venues and wedding services within the Tahoe Valley. Whether you are searching for a wedding photographer, wedding planner, or wedding florist, you will find the best Tahoe has to offer. Gorgeous views of the Sierra Nevada Mountains, the crystal clear waters of Lake Tahoe and your beloved will be your setting. Our favourite location (one of the most photographed locations in the world!) is Emerald Bay on the south shore of Lake Tahoe. Love Tahoe but you want a more traditional ceremony? We have a lovely wedding chapel with all of the Tahoe rustic charm to complete your special day. The chapel seats up to 50 guests and you can book the banquet room for small receptions too. Spectacular year-round, Lake Tahoe offers stunning natural surroundings that enhance the romance and beauty of your wedding day. There are several wedding locations and ceremony venues for you to choose from. Be it the alpine white of winter, golden autumn meadows, lush mountain springtime, or the clear skies of Tahoe summer, the lake always affords a magical, enchanting setting for your wedding day. Lake Tahoe's amazing scenery leaves you with no questions as to why the Native Americans named Lake Tahoe "Lake of the Sky". Browse our Tahoe wedding packages and start planning now! What a fantastic way to start your marriage and new life together! Relax and enjoy your Lake Tahoe Wedding, let us do all the work! Our Tahoe Wedding Packages include everything! The bride will receive a stunning hand-tied bouquet. The Maid of Honor will carry a beautiful ribboned long stem rose that is a reflection of the flowers found in the bride's bouquet, along with the boutonniéres worn by the Groom and Best Man. A luxurious White Wedding limousine will pick you up and take you on a delightful ride to and from your wedding ceremony. Enjoy the complementary champagne and toasting glasses as you experience the beauty of Tahoe. Our gifted photographer is able to capture the magic of the moment at your Lake Tahoe wedding; a color television in the limousine allows you to preview your remarkable photographs instantly. Our Notary makes paperwork easy, and can issue your wedding license on the spot. You can contact us to book today! 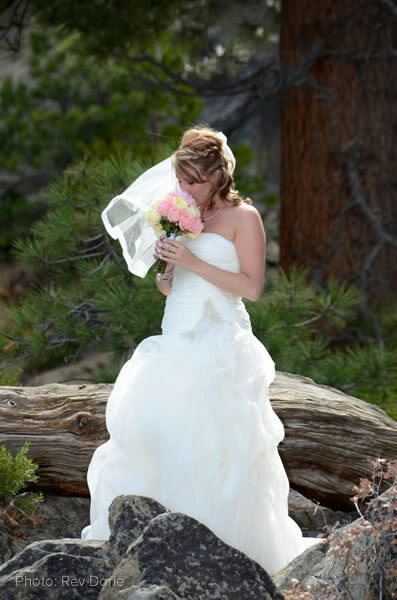 After your Lake Tahoe wedding ceremony take advantage of the numerous outdoor activities the Tahoe basin has to offer. For those who enjoy mountain climbing, biking, kayaking, fishing and skiing, no where in California or Nevada can you find such an array of outdoor sports for you and your wedding party and guests. Do you need flowers, photos, minister, cake, champagne? Don't worry! It can all be arranged to make your day exactly what you dream of. Your wedding day will be perfect, memorable, and enjoyable! We can even create a custom YouTube Video of your wedding that can be shared with friends and family.